LIFELESS by the talented UK analogue photographer Michael Boorman is a zine that has an interesting look into the peculiar nature of mannequins and how something we walk past every day in shop fronts and displays can be created into a body of work that is not only engaging but extremely intriguing as a subject matter. The use of light and shadow within LIFELESS is exceptional and truly guides you through the piece of work. It’s such an important aspect of photography, to be able to execute this in the best possible way and a very difficult thing to accomplish, yet Michael does this seamlessly with this particular zine. 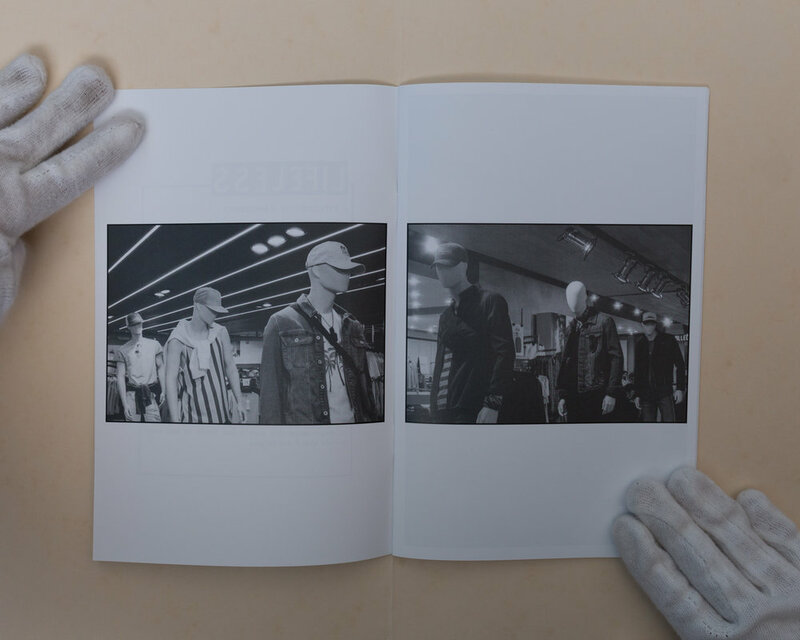 As you open the zine, the initial image is one that portrays a glimpse of what is in store for the following pages of LIFELESS, depicting mannequins in such a way, where they become these objects that Michael is then able to create art from their uniqueness and peculiarity. All captured on black and white film, this certainly adds an extra element to the zine in general, with film, especially when using black and white, I personally feel there’s a soul to the images that digital just can’t compete with. I know that’s most definitely an individual and objective opinion, different to each person, but you can’t deny the greatness of film photography, especially with this series of images. LIFELESS is one of the most exceptionally put together zines that I’ve had the pleasure of owning and gaining inspiration from. Most especially the way in which it flows from image to image with such natural progression and ease between each individual image. The layout is truly something that needs to have its moment too, with this executed perfectly, yet with such a contrasting nature to it, with the combination of full-page spreads of images to a smaller middle paged layout. It’s done in such a way, where it’s not jolting to the viewer, it simply adds to the interest of the zine in general. Not only is the layout brilliant, but with the larger than A5 sizing of LIFELESS, it’s a great size for the images to shine in the most impressive way, with it enabling the reader to fully enjoy this piece of work in the way it was intended. It’s extremely difficult to choose a favourite image from this array of work, but I’d say the images that captured my attention the most were the initial two pages. I adore the way in which Michael captures the use of diagonals in the first two images, with the mannequins lined up perfectly, as well as the shop lighting shot in such a way where it exaggerates the diagonal nature of it. Adding to that would be in the very first image, the angle of the photograph is obtained fantastically, with the lines across the ceiling accompanying the line of mannequins in a way that truly encapsulates everything that is brilliantly executed in this particular zine. To summarize this article of LIFELESS (which by the way I love this play on words, where it’s meaning to imitate LIFE magazine, with a suitable twist to the title), it absolutely stands out from the crowd in comparison to the many other great zines currently in the photography sphere of things. Michael encapsulates everything you’d ever want with this subject matter and this typology of mannequins. It’s truly a very well executed idea from start to finish, with the array of work presented and the way in which it is photographed; from the varying angles to the wide range of unique mannequins and the overall presentation of LIFELESS, Michael has excelled himself with this and I would highly recommend everyone check it out, whilst it’s still available. You can do so by contacting him on Instagram here. If you’ve enjoyed this article, you might enjoy the other A LOOK AT articles we have on YOUR EXHIBITION. Check them out here. Lastly, if you would like to learn a bit more about me, check out my profile here, my Instagram here, or find me on my website.